Interesting..odd...very different from my usual read. Even what I'd normally pick up in graphic novels. Welcome to Burden Hill -- a picturesque little town adorned with white picket fences and green, green grass, home to a unique team of paranormal investigators. Beneath this shiny exterior, Burden Hill harbors dark and sinister secrets, and it’s up to a heroic gang of dogs -- and one cat -- to protect the town from the evil forces at work. These are the Beasts of Burden Hill -- Pugs, Ace, Jack, Whitey, Red and the Orphan -- whose early experiences with the paranormal (including a haunted doghouse, a witches’ coven, and a pack of canine zombies) have led them to become members of the Wise Dog Society, official animal agents sworn to protect their town from evil. This turns out to be no easy task, as they soon encounter demonic cannibal frogs, tortured spirits, a secret rat society, and a bizarre and deadly resurrection in the Burden Hill cemetery -- events which lead to fear and heartbreak as our four-legged heroes discover that the evil within Burden Hill is growing and on the move. Can our heroes overcome these supernatural menaces? Can evil be bested by a paranormal team that doesn’t have hands? And even more importantly, will Pugs ever shut the hell up? I REALLY enjoyed this. I enjoy reading about the paranormal genre. The art is well done, to the point of being pretty in some of the quieter scenes. And the story line(s) is(are) great. The personalities of each animal are exactly what I'd pair with that breed. I love that the Doberman is the chicken and the Pug is a tough guy bully (that they all see through). 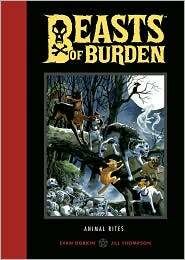 "Beasts of Burden: Animal Rights." Dark Horse Comics . Dark Horse Comics, Inc, n.d. Web. 16 Sep 2010. . I received a copy of this book from Dark Horse Comics as part of my work with Texas Library Association's Maverick Graphic Novel Committee. No compensation was received or discussed. Free, online resources for students and teachers in a variety of subjects. I played with the Algebra modules and found the explanations to be good and the practice questions helpful—when you get the question wrong, it explains why. Several other subject areas are available. (This coming from someone who can do algebra but can’t explain to you how she got the answer!) If you feel so inclined, you can also create your own HippoCampus resources to share. If you feel like the news isn’t terribly uplifting, this series about people who make the world a better place should lift your spirits. Might be good stories to share with your students in those moments when you get to just talk. As someone who’s insanely curious about things and gets sparked into finding out more very easily, this collection of art, history, and science museum blogs makes me happy. The people writing for these blogs are professional curious people. Doing a something a little different and getting our kids’ attention is always a good thing. These sites offer lesson plans, recommendations of comics and graphic novels, and other teacher resources. Helps you identify animals, plants, birds, butterflies and more in your area. Includes a "Critter ID Forum," slide shows, videos, an Ask a Biologist podcast, and more. I SOOOOO want to buy this BOOK....not on Kindle, the BOOK!